When designing furniture one of the things that makes a piece go from the mundane, to “WOW that’s a nice piece”, is choosing an awesome looking piece of wood to feature in the project. It could be anything from that great figure in the wood, to the spalting streaks, and even the cracks and imperfections that make it stand out. Oftentimes when I go to the lumberyard with a design in mind, I am looking for one of those WOW pieces of wood to feature. However, most times I just can’t find exactly what I am looking for. The stack has either been picked through by others before I got there, sorted out before that particular shipment arrived at the dealer, or mother nature just didn’t provide what I wanted that day. 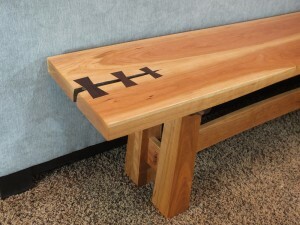 Not all is lost; there are other resources such as veneering, as well as other woodworking techniques that can be employed to mimic the desired piece. Much like in the case of my recent project. 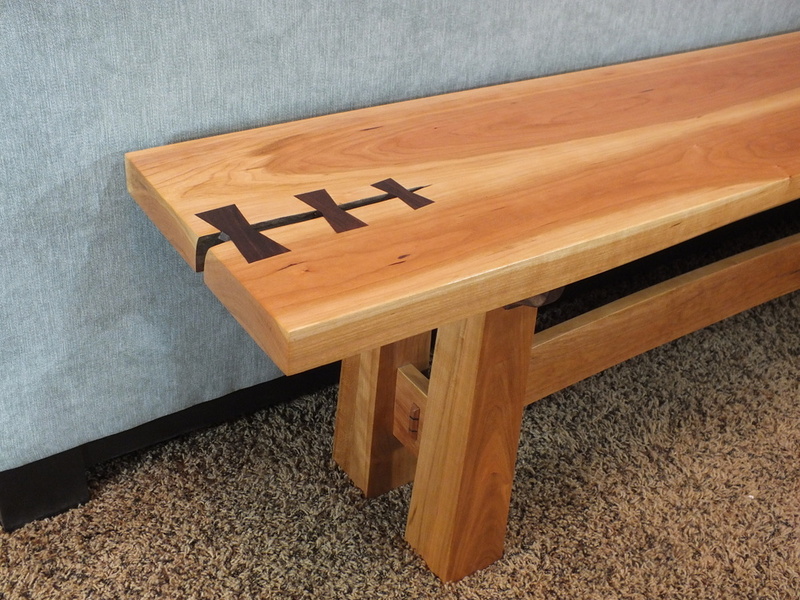 I was building a bench and wanted to add a decorative feature by putting butterfly inlays over a crack in the wood. I scoured all of my local lumberyards within a two-hour drive of my shop to no avail. 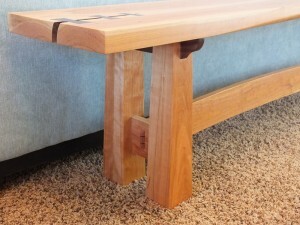 It seemed that the perfect piece of cherry that I could visualize in my imagination just didn’t exist in real life. Once I was out of lumberyards to visit, I started thinking of other options I could use to incorporate the use of butterfly inlays. I didn’t like any of the options I came up with so I decided to make my own crack. I started out by jointing the two boards I picked out for the top to be sure I like how they looked together. I then sketched the shape of the crack I wanted on the top and on the ends of the boards. I used a carving wheel on my grinder, various rasps, and sandpaper to create the shape. I worked slowly taking only a few passes at a time and then sliding the boards together to be sure I was on the right track in making a shape I liked. When I was finished, I had carved a convex shape on one board and a matching concaved shape on the other. The resulting shape made it look like they had been one piece that had split apart. I thought it looked great with the crack in the wood meandering back a few inches from the end. Before gluing the two boards together, I stained the area I had carved on making it look like the split in the wood had been there for a long time. I think the result was a nice solution when I was not able to find that choice piece of wood in the wild.